In the past decade, China seems to have grasped the problems yielded by an export-led growth model, and tried to rebalance away from exports (and lately investment) towards consumption (more here). The adjustment is slow, sometimes incoherent, but it is happening. Germany’s economic size, its position of creditor, and its relatively better performance following the sovereign debt crisis, (together with a certain ideological complicity from EC institutions) allowed Germany to impose the model based on austerity and deflation to peripheral eurozone countries in crisis. Even abstracting from the harmful effects of austerity (more here), I then pointed out that the German model cannot work for two reasons: The first is the many times recalled fallacy of composition): Not everybody can export at the same time. The second, more political, is that by betting on an export-led growth model Germany and Europe will be forced to rely on somebody else’s growth to ensure their prosperity. It is now U.S. imports; it may be China’s tomorrow, and who know who the day after tomorrow. This is of course a source of economic fragility, but also of irrelevance on the political arena, where influence goes hand in hand with economic power. Choosing the German economic model Europe would condemn itself to a secondary role. 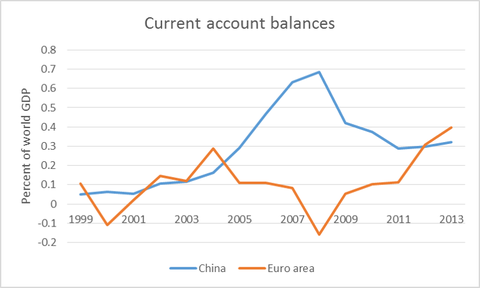 I would add that the generalization of the German model to the whole eurozone is leading to increasing current account surpluses. Therefore, this is not simply a European problem anymore. By running excess savings as a whole, we are collectively refusing to chip in the ongoing fragile recovery. The rest of the world is right to be annoyed at Germany’s surpluses. We continue to behave like Lilliput, refusing to play our role of large economy. do you think that it is just a case that only now, for the first time, the States blame Germany for its political economy? Doesn’t it have anything to do with the American shutdown? I would like to know your opinion about it… thanks. Thanks for your comment. The excess savings of a few countries are a long standing problem, that goes beyond the current crisis (even more so current events in the US). The American treasury seems to have understood that excess savings (and excess spending, of other countries, that are the counterpart) cannot lead to balanced growth in the long run. Labour Costs: Who is the Outlier?